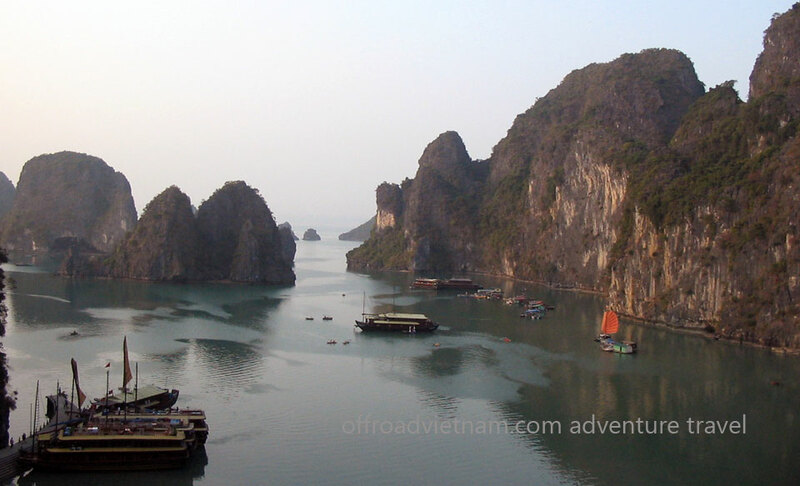 Halong Bay motorbike cruise in 3 days / 2 nights. Day 1: Hanoi – Bai Chay – Halong. ~170 km, ~5 h.
Today is the first day of this Halong Bay motorbike cruise in 3 days. Before starting to ride, we will have a short briefing to let you know about the rules. In addition, the guide will show you how to understand him by his body language. We start around 9.30am after the rush hours. Ride to Bai Chay (now it’s Ha Long City) in 5 hours. In general, it’s a good sealed road. Then, we promenade along the coast in Halong City. A junk is waiting to take us and our bikes to cruise in Halong Bay. Lunch with seafood on the boat. Boating to Thien Cung cave, fishing village and then through myriads of limestone to Ba Trai Dao (Three Peach Fruit Islet). Finally, swim and sleep here. Day 2: Cat Ba. Boating. Arrive in Cat Ba and check in Princes Hotel. Finally, take a little boat (sampan) to the floating restaurant for dinner. Day 3: Cat Ba – Hanoi. ~120 km, ~3 h.
Motorbiking on Cat Ba Island in the morning on the mountain road. Then catch a ferry at 1.30 pm to Hai Phong. Drive back to Hanoi in 2 hours. Contact us now to book this tour or to know about different itineraries and options of this Halong Bay motorbike cruise in 3 days.